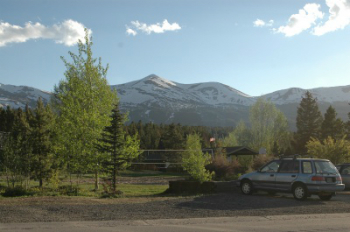 The French Creek homes for sale were developed starting in 1963 to provide affordable housing for locals – the workforce – of the young Ski Resort of Breckenridge. It has always been an alternative to condominium living in the Breckenridge Resort. Some of the homes are pre-manufactured and arranged on small lots in an irregular pattern. The beauty of French Creek is the location – the views of the Ten Mile Range and Baldy Mountain. It is designed as a living community built around recreation. Available to every French Creek resident are the large clubhouse, the indoor pool, playground, volleyball court and tennis court. All homes are close to the free transit stop. You can start your search with the updated French Creek real estate listings below, or read more about this well-established community. French Creek homes are well-located to a variety of recreational activities. Several trails are close to this neighborhood, a few that give a more scenic route into downtown Breckenridge and others that lead mountain bikers and hikers into the backcountry are just a short walk away. Swimming, tennis, and volleyball are on-site within the community. Many residents take the nearby free transit into the Breckenridge Ski Resort during the winter months. The homes are a mix of single and two story. Many updated and remodeled since the area was developed in the 1970’s. French Creek is a family oriented neighborhood between two high-end subdivision; closer to town than the Highlands and just across the river from the newer neighborhood called Corkscrew. It is on the same major artery – French Gulch Road – but closer to town – than the newer Wellington Neighborhood. Size: 784sq. ft. to 2566 sq. ft.
French Creek is located just north of the Town of Breckenridge. From Breckenridge Main Street turn right at the first light after the traffic circle onto Co Rd 450/Huron Road. Continue .4 mile and turn right on to Co Rd 460/Reiling road and you are in the French Creek Development. Contact us to speak to a local Breckenridge real estate expert. Listing information last updated on April 19th, 2019 at 8:18pm MDT.